Cloning has the potential to be an extremely valuable tool across many fields. In agriculture, the reproductive cloning of farm animals could prove to be advantageous. In clinical medicine, the employment of therapeutic cloning for cell, tissue, and organ replacement appears to be imminent. However, as with any advancement that is poised to touch human lives, the process of cloning must be looked at through the lens of the medical community’s obligation to do no harm. Epigenetic Risks of Cloning includes contributions from 32 leading researchers who are intimately involved with various aspects of cloning. At the frontlines of this science, they are best positioned to explain what is really occurring. With chapters dedicated to each of the animal models being employed for experimentation, the text presents a detailed accounting of cloning methods, an objective review of current findings, and an even-handed discussion of potential concerns. While procedures utilizing a variety of somatic cell types to create cloned animals have proven to be repeatable, efficient consistency has proven to be elusive at best. Less than four percent of reconstructed embryos typically develop to adulthood. This low success rate is the cumulative result of inefficiencies occurring at every stage of development. Epigenetic Risks of Cloning considers the very real consequences of those inefficiencies. In addition to embryonic loss, cloning experiments have experienced very high rates of fetal, perinatal, and neonatal loss, as well as the production of abnormal offspring. At present, there is a legitimate concern that the propensity for epigenetic errors could be paralleled in human embryos. 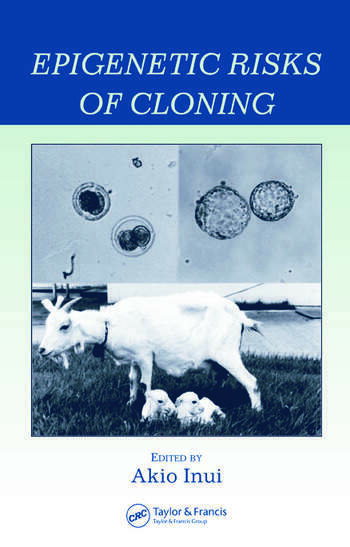 This book offers an excellent opportunity to become acquainted with the current state of cloning, both the methods being utilized, as well as the risks being realized.